Transformers: Forged to Fight is a game about giant transforming robots fighting each other. When said giant transforming robots are fighting each other, it is very good. The rest of the time? It’s complicated. As I mentioned earlier this month, beating up Transformers is a good time. 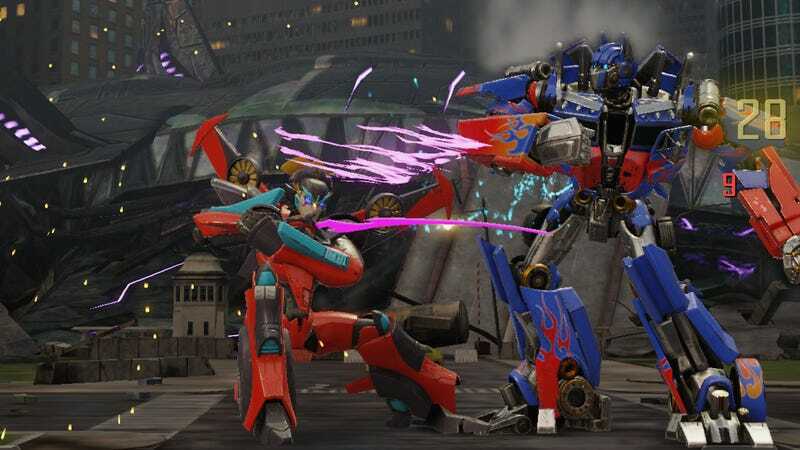 Developer Kabam promised an exciting mobile fighting game with great renders of robots from across most ages of Transformers continuity, and that’s exactly what a portion of Transformers: Forged to Fight is. If it were only that, with the option to randomly purchase additional characters, I’d be perfectly content. But this game is more . . . much more . . . than meets the eye, and I’m not terribly fond of all the extra bits. This is the adventure map, which players traverse as they make their way through the game’s story mode. This isn’t bad. Players create teams of characters of different types, each stronger or weaker than other types. They follow the branching paths, every now and then encountering another robot to battle. If they’ve got a well-balanced team, it’s a walk in the park. The game takes place on new Quintessa, a planet created by the multi-faced creators of the Transformers (in certain continuities) as the stage for a sort of contest of champions. It’s a neat concept. If we gave letter grades, story mode would get an N, because that’s my favorite of the letters. This is my base. I do not like my base. It features numerous points for harvesting shiny yellow currency, which is used to take on missions and upgrade characters. Players can assign robots to protect their base nodes, as they are called. These robots are not allowed to fight while defending, which immediately makes them less attractive. Players can also assign mods to their base nodes. Both the mods and the robots must be upgraded in order to keep other players from invading and stealing resources. They will invade and steal resources anyway. Not a big fan of the whole base maintenance thing. From the base players can access their mobile command, where bots can be assigned to timed missions to harvest several different types of resources. Going on missions excludes characters from fighting. The trade-off is gathering large numbers of things to keep track of. This is a lot of different things to keep track of. Players can spend these various icons on various things in various places throughout the game. They can also donate three different sorts of things to their Alliance. In the image above, someone has donated 22 gold things to my Alliance. It was me. I am not sure what donating the 22 gold things did. But I donated. Sparks are things you can collect through battles or story missions. They are an important factor in leveling up your robots. In order to rank up my three star Bonecrusher I need two T1 warrior sparks and one T2 basic spark. So far the main way to get the T2 basic spark seems to be buying shards of them with raid points until I have enough to combine into a real virtual item. I can also sacrifice robots to increase Bonecrusher’s Forge Level. I am not sure what that means. Look, I am Commander Level 12. My player level is 17. Obviously I am getting experience points. Let me just give those to my robots instead of harvesting experience cubes and then having to spend gold things to apply those to my characters. These are not crystals. They are pieces of crystals. I need pieces of crystals to make a crystal. Or I can just buy some crystals with energon, which is another thing to keep track of. In order to purchase a premium robot crystal for a chance (and not a very good chance) of getting a better robot buddy, I have to first buy (or slowly earn through gameplay) Energon. I have 50. A crystal costs 100. The lowest denomination available costs $4.99 and would give me enough to get one crystal. I would like to just buy a good robot. There are a couple of bundles I can buy featuring Ultra Magnus or movie Bumblebee, but I would like to buy a good robot. Oh well, at least I have plenty of transforming robot battles to take my mind off the rest of Transformers: Forged to Fight.